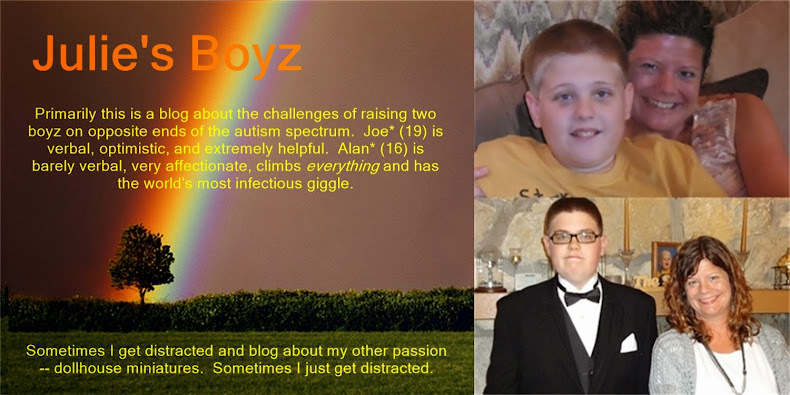 As Joe is approaching his 18th birthday and he is such a nice, polite young man, I force myself to remember funny (and annoying) stories and phases. One of the best/worst came during his 8th grade year. He had made some fairly significant strides in the year or two proceeding this and we had changed his medicine a couple of times settling on one that seemed to work. We slowly ramped up his meds until we though he was at a "good" level. After a few weeks (maybe a month) we noticed that this level didn't seem to be appropriate anymore. He was argumentative and getting in trouble in school and he had several meltdowns at home so I took him back to the psychiatrist and he gave me an additional prescription for a slightly higher dose but for some reason, I did not get it filled right away. DH comes inside and opens up three napkins that contained a full dose of Joe's meds. We have no idea how long he was throwing away hundreds of dollars worth of medication, but it was long enough for them to get completely out of his system and for us to observe the results. It turned out he didn't like the taste of one of his vitamins but instead of telling us that, he just threw them all away. Although for several days he protested that he really did not think that the lack of medication was affecting him at all, once he was back on his medicine and he was calmer and successfully dealt with a few problems he actually told us, "I feel better on my medication." So while it was a painful lesson to learn, it was one that was best learned then and not once he was out "in the real world".